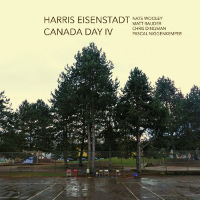 Harris Eisenstadt’s Canada Day group has been active for seven years now, and in that time they’ve managed to release several albums of idiosyncratic, hybridized jazz. Although the pieces are undoubtedly composed, the structures are spacious, and the pace is unhurried - the individual players have ample time to explore the architecture, investigate avenues of interest, and stamp everything with their own singular marks. Since 2006, the general configuration of the group hasn’t changed much: while one release in 2012 utilized an octet, the plainly-titled Canada Day releases stick with a quintet, consisting of drums, vibraphone, trumpet, tenor saxophone, and bass. Only the last instrument has seen any personnel changes: from Eivind Opsvik on the first two recordings, to Garth Stevenson on the third, to the illustrious Pascal Niggenkemper on this, the fourth. I admit that I was excited to see his name listed in the credits; his work with Joe Herteinstein and Thomas Heberer on the HNH albums (reviewed here and here) is absolutely superb, alternating between free-flowing fluidity and taut, groove-ridden propulsion. As for the other members, there is Chris Dingman on vibraphone, Nate Wooley on trumpet, Matt Bauder on tenor saxophone, and Eisenstadt himself on percussion. In the opening piece, “After Several Snowstorms,” Niggenkemper doesn’t waste any time in showcasing his bold bass-work. Along with Eisenstadt, he provides the solid ground upon which the other members of the group can carry out their varied excursions. Chris Dingman’s vibraphone tones are airy and enigmatic, lending a near-cinematic quality to the proceedings. Basking in this noirish radiance, saxophonist Matt Bauder and trumpeter Wooley stretch out, get comfortable, and thread their winding, sinuous lines throughout the composition. Wooley is always a pleasure to listen to, with a style rooted in raw physicality and, at times, sheer abrasion. He never goes too far out with this group, however - just enough to keep things fresh and engaging. “Sometimes It’s Hard to Get Dressed in the Morning” is an ethereal dreamscape, bathed in Dingman’s rich, euphonious phrases. Listening to this piece is akin to squinting at a snow-capped mountain-range, sunlight flooding the scene in indistinct washes; the finer details get submerged, but the overall impression is one of majesty and sublime beauty. “Let’s Say It Comes in Waves” finds Niggenkemper propping everything up with yet another solid groove. Meanwhile, Wooley and Bauder deliver some of their most exploratory lines yet, Wooley moving from dizzying cascades to caustic swathes of sound, and Bauder matching him with his sputtering exhalations. If I don’t seem to be paying much attention to Eisenstadt, it’s because he’s such an unostentatious leader. He doesn’t draw much attention to himself, opting instead to undergird the compositions with his reliable, unwavering rhythms and textures. Suffice it to say, he’s a versatile percussionist with a great deal of stylistic flexibility - he swings, he billows, he rattles, and he rolls. In many ways, Eisenstadt and Niggenkemper are the anchors of this group, keeping the whole ship afloat while the others explore more uncharted territory. “Life’s Hurting Passage Onward” is distinguished by an extended solo from Wooley - but this ain’t your grandpa’s trumpet solo. Wooley spits, scratches, and skronks, turning his instrument into something like an extension of his own body; it’s not a tool to be utilized, but an attachment, a limb or tract that is prone to febrile convulsions and inexplicable outbursts. For those familiar with Wooley’s work, it won’t come as a shock, but it’s certainly interesting to hear these kinds of timbres and textures in such a (relatively) subdued context. “What Can Be Set to the Side” ups the tempo and puts Dingman in the spotlight. Here, he goes a little wild, temporarily doing away with the wide-scale resplendence of the other tracks and producing wild flurries with his vibes. Towards the end of the piece, the other members join in, and what we get is a fun, frenetic romp that livens things up a bit. The final piece, “Meli Melo,” is a perfect way to wrap up the album: it encapsulates everything this group does well - the solid rhythms, the atmosphere, the textures, the tantalizing hints of avant-garde..it’s all there. All in all, this is a more-than-worthy inclusion in Harris Eisenstadt’s Canada Day recordings, and it might very well be the best. Thanks for the comment, Derek. I've enjoyed the older Canada Days albums and this one sounds as if it is another must have for me. Pascal Niggenkemper is a great new member of the band, I've had the pleasure to see him in very different collaborations lately (with Gebhard Ullmann's Basement Research, Scott Field's band and his own sextet 7ieme Continent). In all ensembles he was excellent, he seems to be one of the most promising bassists of his generation. It's interesting to compare this band to Nate Wooley's quintet since Eisenstadt is also on drums there. Niggenkemper alone makes this album slightly more intriguing than the last one, though Eisenstadt's also bringing his A-game to the composition. I just love the lightness of the group's sound. I can't remember why this didn't make my top-10 list last year, it's one of the albums I've listened to most. I definitely agree with Martin, there are some interesting comparisons to be made to Wooley's quintet, contrasting Dingman with Moran, Niggenkemper to Opsvik (though Opsvik was the original bassist, I think?? ), and Bauder to Sinton. These albums also pair nicely with Fujiwara's Hook Up band.